Indian Army Clerk Examination question paper of 2018 and you all must be enthusiastically waiting for the answers. So students now you can download the question paper and Solution PDFs of Indian Army Clerk 2018 which you can download and practice for your other upcoming exams. Practicing Clerk Indian Army papers helps in familiarizing the aspirants with the pattern of the exam. Solving the Clerk SKT exam paper will help you analyse your mistakes and rectify them in the upcoming exams. 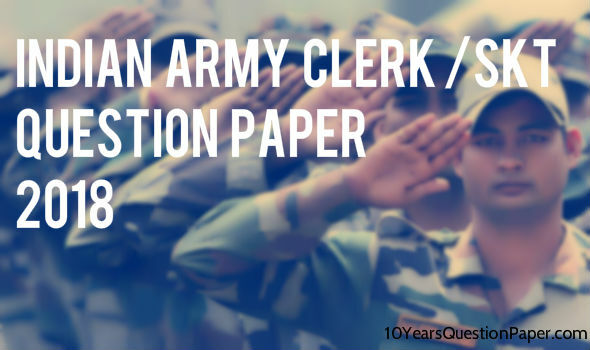 Indian Army Clerk question paper with answer key 2018. Indian Army Clerk/SKT 2018 syllabus General Knowledge 05 Questions for 20 marks, General Science 05 Questions for 20 marks, Maths 10 Questions for 40 marks, Computer Science 05 Questions for 20 marks and the passing mark for Indian army was 32 marks. By going through the previous year paper, you can work on your time management skills so that you are able to attempt the maximum number of questions in a minimum time period. And when you have a fair idea of all your strengths and weaknesses, you can surely bring the house down. Indian Army Clerk syllabus & question paper pattern. Indian Army Soldier Clerk (SKT) question paper pattern and syllabus are given below. The Clerk paper is divided into parts A, B, and C. Part A is General knowledge, Part B is General Science and Part C is Maths and the passing marks are 32 out of 100 marks.